By default, when you save a game, the title that is used is the title of the game. However, this isn’t very useful. It would be better to show something more relevant to the actual save file, such as a map location, or the current chapter, or anything else. With this plugin, you can use events to determine what the current save title should be. Download ths plugin and place it in the “plugins” folder in your project’s “js” folder. Then open your Plugin Manager (F10), double-click an empty row, and select the HIME_SaveTitle plugin. 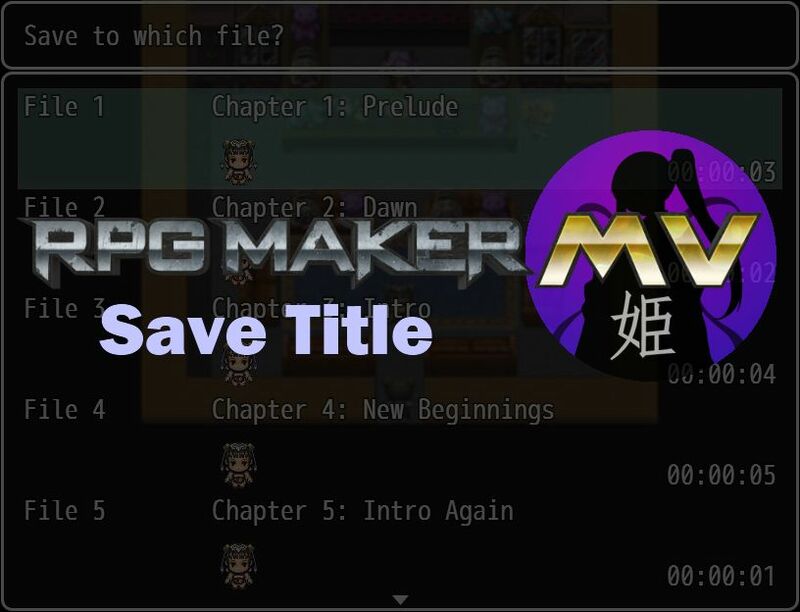 Then when you save the game, that will be the title that is shown. When I run my game on browser, it doesn’t seem to save properly when this plugin is enabled. Are you aware of this bug? No matter what I put into the plugin, whether it be a string or a formula, the save title ends up being blank. Did you remember to put the quotation marks? I’ve tried setting this up, but whenever the plugin is enabled my save files all show a blank name. I have tried using the map name as well as hardcoding text, each with the same results. TH.setSaveTitle(“Chapter 1”) will blank out the save name. how do you make it so it displays a actor name with the chapter? this is as close as i got. WOW! It works even with Yanfly’s Save Core!!! I’m trying to get this to work with the Save Core, but I don’t know what to put so that it says the title that I want? What is “Save Core”? To use this plugin, you would make script calls to set the name of the title. I tried to implement this plugin here into a project of mine though I’ve got the problem that the Safe Files after implementing wont show any Name what so ever. Hi Hime, can we write name hero ? But when it’s the player who select a name ? Which will use the name of the leader of the party. Instructions updated. See how it should be used. Ah, I just realized I was testing with a different script call. The purpose of specifying a string is so that the name is evaluated during the save process. For example, let’s say you set the title to the current map’s display name, and then you change maps. If you don’t evaluate it at run-time, it will be whatever the string was on the map you called setSaveTitle. Is it possible to make this compatible with Ark’s Save Engine? Hello. This script seems not working in RPG Maker MV v1.1.0? When I save, the save file will be break (can’t load again). But when I turn off this script it will ok. There was a bug before. See if updating the plugin will help. It works now. Very sorry to bother you. PS: It works in new project but work not in my current project. So I think it’s script conflict. I will find what happened by myself. Let me know which script it is having issues with. Hi! This looks like exactly what I’d like, but I’m having a hard time getting it to work. 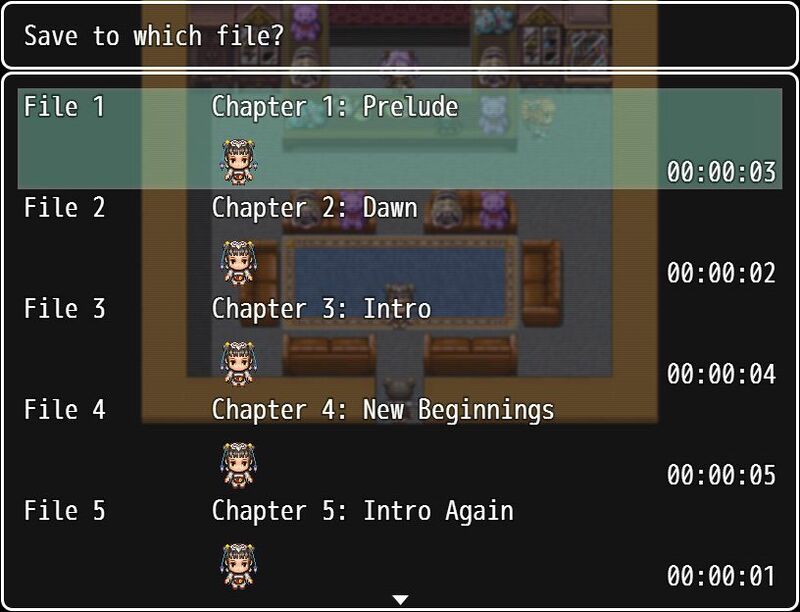 Pretty new to using scripts/plugins in RPG Maker projects in general. However, this prevents me from saving anything at all when I go into my menu and try to save. If I try to put the same thing in a Plugin Command, I just get a save file with a blank title. How should I be plugging in this to my events to call the function you’ve created appropriately? Thanks! I’ve updated the plugin to address the issue. See if it works now. Very nice plugin but I have a problem utilizing it during my project. I inputted the save title within my save event but when I try to save, instead of saving the progress of the game it deletes a file. When the plugin is turned on it instead deletes the saves instead of saving with the new save title. Would like to know how to fix it or if I’m doing something wrong. Thanks for another great plugin though! And see if the problem still occurs. If it doesn't, maybe there's another plugin that it conflicts with, or a bug in my code that doesn't occur until certain conditions are met. Yea I tried saving with the example title but again it won’t save at all. I have tried to avoid the problem with starting a new project and using the debug demo but it still won’t work. The saves are still being overwrited with blank data and a save title is not being displayed. I’ve updated the plugin. It looks like one of the previous changes I introduced had required you to set titles in a specific format that don’t reflect the instructions. Late response but thank you for updating the plugin, greatly appreciate it. Hopeful success to you and your endeavors. Is there any way we can call variables in this? Like, if I wanted to have it display the name of the current room, do I need to manually set it every time I enter a room, or is there another way? Totally fine if it’s the former, mostly just new to scripting. If I allow it to accept formulas so that you can say something like &quot;$gameMap.displayName()&quot; So that it will display the current name of the map, would that work? If you wanted a specific name, you would still need to make script calls to change it everytime. I’ve updated the plugin support formulas.